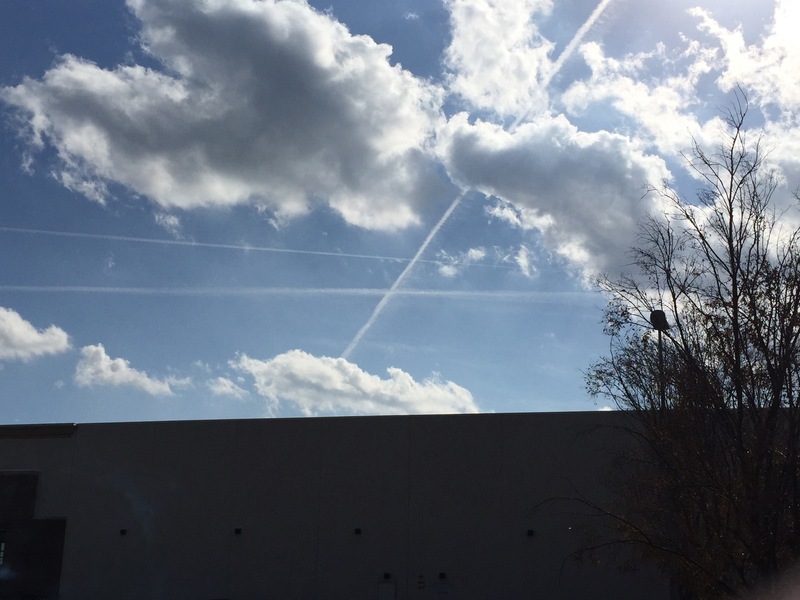 Just sitting outside on my lunch break and I look up, and behold….chemtrails up above. If you don’t know what chemtrails, or geoengineering is, I’ll briefly fill you in, and I’ll write a more detailed report later. In its most simplest form, they are spraying the sky with metals, mostly aluminum and barium to, as they say, “to help cool the earth”. I call BS on that. They say the aluminum in the air helps deflect the Suns Rays from hitting us and thus cools us down. In reality, it is poisoning us, the ground and the water. We already have enough toxic metals in the ground and in our food and we really don’t need more. They poison the ground so it makes it difficult to grow plants, unless of course they are Monsanto GMO plants. The geoengineering plan has been going on for years, and is not disputed. There are several government documents laying out their plan that I will post later. For more info, just google, what in the world are they spraying. Lots of good info out there.